The ship (bark or barque, barchetta) was an ancient Christian symbol. Its is the Church tossed on the sea of disbelief, worldliness, and persecution but finally reaching safe harbor with its cargo of human souls. Part of the imagery comes from the ark saving Noah's family during the Flood (1 Peter 3:20-21). Jesus protecting the Peter's boat and the apostles on the stormy Sea of Galilee (Mark 4:35-41). It was also a great symbol during times when Christians needed to disguise the cross, since the ship's mast forms a cross in many of its depictions..
"In the Apostolic Constitutions (II, xlvii) the bishop surrounded by the assembly of the faithful is compared to the helmsman of a ship; but the idea is as old as Tertullian (De bap., xii; P. L., l, 1214) and it was varied sometimes by comparing the Church to the Ark of Noah. In any case the ship was a recognized Christian symbol and Clement of Alexandria approved it for a signet ring. "Let the dove or the fish", he says, "the vessel flying before the wind, -- or the marine anchor be our signets" (Paed. III, ii; P. G., VIII, 633). Numerous representations of ships, sometimes serving as the design for a lamp, with the figure of Christ or St. Peter as helmsman are preserved to us. The name which we still retain for the "nave" (French, nef) of a church bears testimony to the persistence of the same idea." (Herbert Thurston, "Symbolism," Catholic Encyclopedia, 1909). The ship is also sometimes used as an emblem of St. Jude. St. Ursula was often portrayed as helping sinners into her boat to save them from drowning in the seas of the world. Ship sailing heavenward, from the Lapidarian Gallery. Stained Glass Window, Palm Lutheran Church, Palmyra, PA.
Tapestry of the Barque of Saint Peter at St. Peter's, Dartmouth, Nova Scotia, Canada, by Mr. Back. Architectural ornament, by Walter S. Arnold, sculptor/stone carver, Chicago. Ark of Salvation, Orthodox iconic style. The ship on the ocean with a cross for a sail is the logo of the National Council of Churches in the USA, Churches Together in England, and the World Council of Churches, of which a number of church bodies are members. Fragmento del remate de la tapa de un sarcófago paleocristiano (siglo IV). Los cristianos que podían mandarse hacer sarcófagos de mármol pedían que labraran en ellos símbolos y episodios tomados del Antiguo y del Nuevo Testamento. El común denominador que expresa el significado de estas obras artísticas es el de la certeza de la salvación a través de la Fe en Dios. Los nombres grabados cerca de cada uno de los personajes explican quiénes son: IESUS el timonel, y los remeros: MARCUS, LVCAS y (IO)ANES. Jesus and the evangelists in a boat rowing. Vatican. The Church as the "ark of salvation," a third century representation found in Tertullian's Carthage, of a common ecclesiological image in the "Orthodox" churches. Boat of St. Jude. 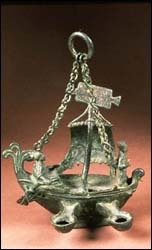 Symbol of the Church itself, the boat or ship is especially identified with our Patron saint, Jude the Apostle. Painting, St. Jude's Anglican Church, Brantford, Ontario, Canada. Sometimes the leadership of the current pope is referred to as guiding the Barque of St. Peter. Barque of Peter is part of the coat of arms of the Diocese of Vancouver. More. Giotto Di Bondone (1267-1337), Navicella (1305-13), Oil on canvas, 740 x 990 cm, Fabbrica di San Pietro, Rome. Painting of Peter out of ship walking on water. Julius Schiller. Coelum Stellatum Christianum, 1627. Constellation II. Saint Peter's Boat formerly Ursa Major.